Additional Info: Well equipped kitchen for six. China, cutlery, cooking equipment etc. Low voltage kettle and toaster and extra fan heater. Duvets and pillows provided but will need your own bed linen and towels. Patio furniture, i.e. table and chairs. Decking. Prices per week plus refundable £50 bond to cover breakages or any extra cleaning if necessary. 25% deposit upon booking and full payment to be received four weeks prior. Please contact for prices between low and high season. Would prefer Saturday to Saturday bookings, though Friday to Friday or Sunday to Sunday considered. 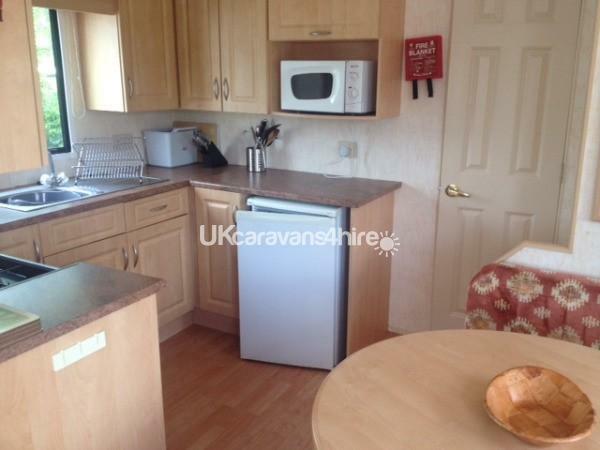 Comfortable, well presented and well equipped three bedroom caravan. The windows in the living/kitchen area all have venetian blinds and curtains. The lounge has a gas fire and a (lowish) wattage electric heater. There is a dining table with seating plus stool. 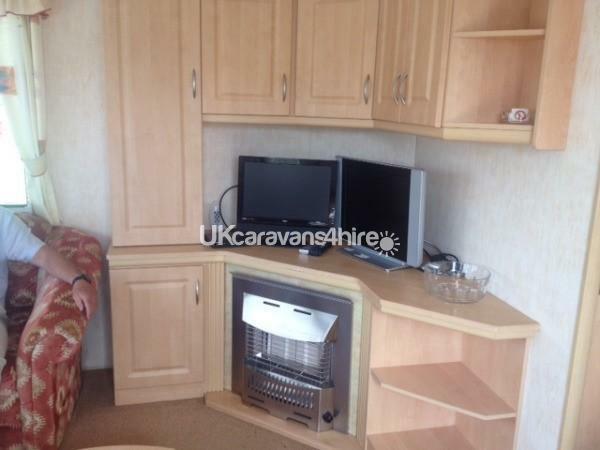 The caravan has a free-stat 32" television with a built in DVD. There are books and DVD's. A radio cassette/CD player. Wi-fi is available for a reasonable charge. Sunny position with decking/ outside patio table and chairs. The parking (for one car) is alongside. (An extra parking space is available for a small charge but please let us know.) If another car parking space is required but not notified to us, then you will not be able to park any extra vehicles. There is an outdoor heated swimming pool and a children's play area. 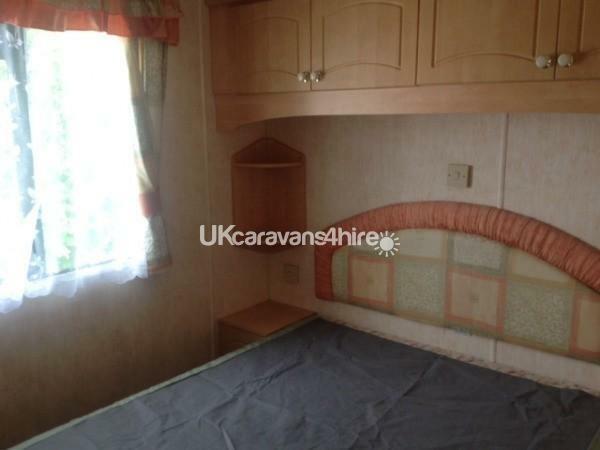 The double bedroom has two bedside cabinets, overhead cabinets, two wardrobes, one hanging and one with shelves. A dressing table with large mirror, overhead light and shaving point. 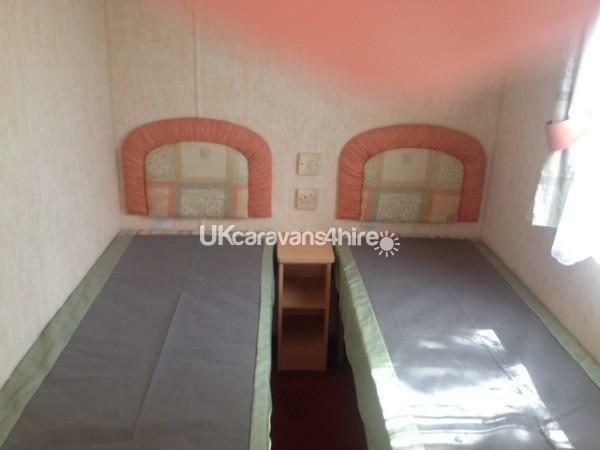 The two other bedrooms each have two single beds, with shelving and wardrobes. There are electric heaters in each room. There is a separate loo with a hand basin and a large mirror. A shower room with a hand basin and spacious shower cubicle. There is a heated towel panel. 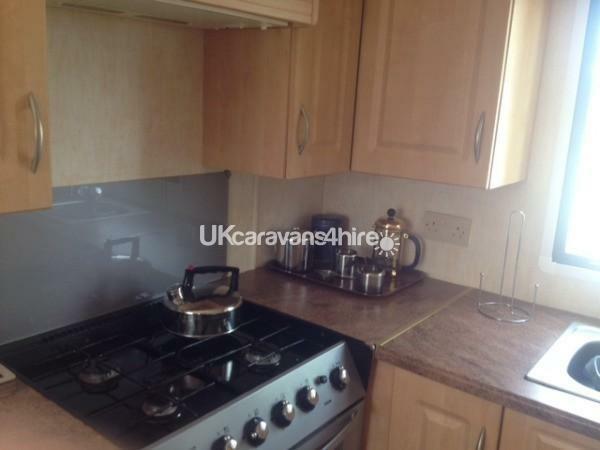 The kitchen has a full size gas cooker, toaster, kettle, refrigerator, microwave. 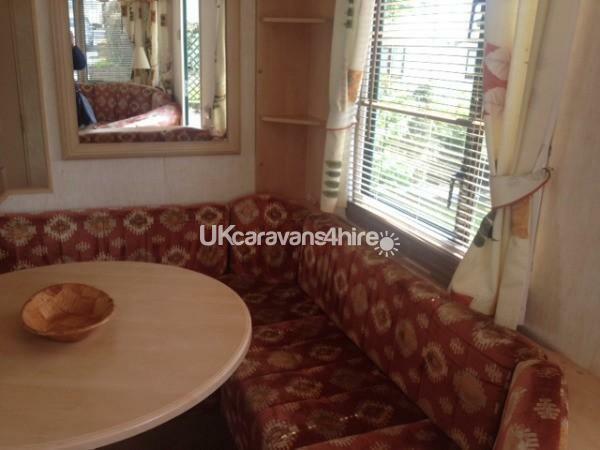 Fully equipped with saucepans, cutlery, china, glassware. Amroth is a 5 minute drive away with it's fabulous Blue Flag beach. There are shops, Bars, pubs, cafes, restaurants. You can get take-aways in some establishments. The Site is convenient for touring the rest of West Wales, visiting ancient castles, other beautiful beaches (including Barafundle, recently voted the most beautiful beach in the world) and various different attractions. There are golf courses and riding stables. Wildlife and fishing boat trips. There are numerous activities available within the area including Oakwood Theme Park, Folly Farm and Anna's Zoo, ideal for children (and grown-ups too). There's an Amusement Arcade in Saundersfoot and a Leisure Centre (and pool) in Tenby. Pembrokeshire is an area of outstanding natural beauty. Amroth is at the start of the Pembrokeshire Coastal Park which goes to St David's and continues onto St Dogmaels. The coastal park is 186 miles in length and within the Pembrokeshire National Park. Additional Info: Heated outdoor pool. Children's play area. Pleasant gardens. Laundrette. Friendly, family site.